E-mail us for payment and shipping information. Use "Contact the artist" in the upper right corner of the page. Ulu knives. Perfect for chopping herbs and salads, cheeses, and meats. Six inch stainless steel blade. Exotic wood handles. Stand included. $25 each. Iris. Scroll saw cut out with painted backing. $50. Fish and plants. Scroll saw cut out with painted backing. Framed. $40. If you have a design silhouette, we can produce a similar plaque to these. E-mail for details. Hummingbird and flower intarsia. Circle is 7" diameter. Widest diameter is 9.5". $45. True INTARSIA. 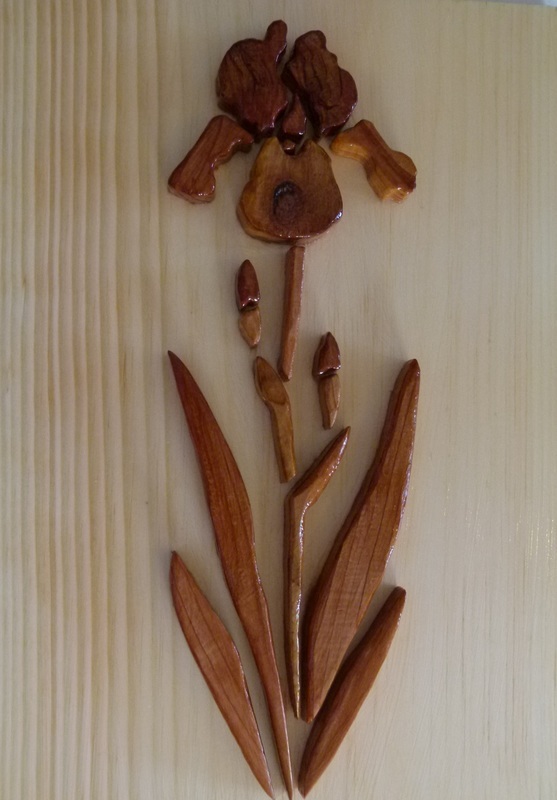 This iris is from western red cedar and yellow heart wood. 6.5" x 15.25" $70. Basket/bowl. This one is 15" with mahogany stain. Can be made smaller. Original pattern is 5.5". $40. 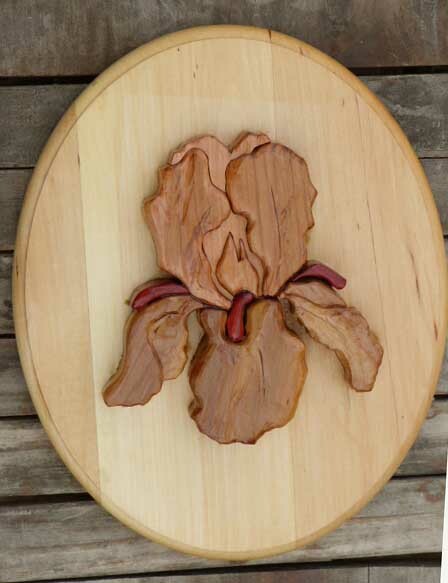 Bearded Iris on 8x10 oval wood plaque. Flower is from Western Red Cedar, with beards from Paduak. $40 includes shipping.